Kirsten Gillibrand confronted a piece of fried chicken in South Carolina over the weekend. She began to eat it with a fork, realized that others around her were using their hands, asked if she should do likewise and ditched the utensils. Reading the reports of this, you got the sense that she would have grabbed that chicken with her pinkie toes if she’d been told to; she would have sucked it through a very large straw if those were the cues. Anything to conform. Anything to please. 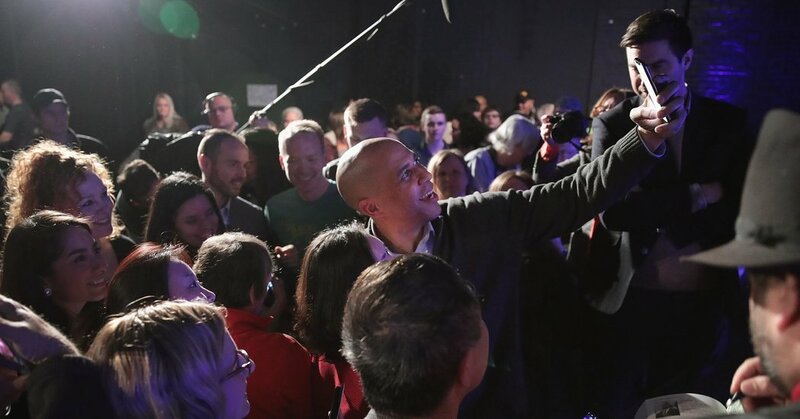 Cory Booker, in Iowa, fielded a question by a reporter representing a foreign news organization. “Puedes hablar español?” he responded, misidentifying the reporter’s accent, according to a video distributed by David Gelles, a CNN producer. The reporter corrected Booker: “No, Swiss radio.” “Swiss!” Booker exulted. “I do not speak Swiss. I cannot even say Swiss cheese in Swiss.” Vegan humor? Booker is a vegan. He’s also pathetically eager to connect. Memo to Democratic presidential candidates: Stop it. Just stop it. Lose the sycophancy. Reclaim your dignity. Eat chicken however you naturally would. Don’t invent languages — there’s no such tongue as Swiss — just to win points. It’s good to be relatable, and a little humor, if unforced, goes a long way. But there’s a line between courting and groveling, between reaching out and rolling over. And in this early stage of the 2020 campaign, Gillibrand, Booker and too many other contenders for their party’s presidential nomination may be losing sight of it. Have they learned nothing from Donald Trump? I’m not suggesting that he’s some shining model and sagacious tutor, but he did go farther in politics than he had any right to, and a few of the reasons are worth noting and maybe even emulating, if only out of pragmatism. One of those is the impression he gave — or maybe I should say the illusion he wove — of not caring too much about what people thought. If they were shocked, so be it. If they were offended, boohoo. He was his own gilded man, going his own grotesque way. And a consequential percentage of voters respected that. They recast his obnoxiousness as authenticity, interpreted his infantilism as independence and gave him their support because he didn’t seem to be prostrating himself for it (though, in many senses, he was). Elizabeth Warren should take note. Actually, she should have taken note before that cringe-worthy Instagram Live video in which she decides — on the spur of the moment! — to grab a beer from her refrigerator and coos appreciatively when her husband pops by, as if his appearance in the kitchen of the home they share is some splendid surprise. She wants to show how cuddly and unpretentious she can be. But it comes across as a performance. So it communicates tentativeness rather than certainty, weakness instead of strength. The rapidly growing field of Democratic candidates — Amy Klobuchar joined the gang on Sunday — is packed with impressive talent. But right now it’s also lousy with obsequiousness. As I and many other journalists have observed previously, the contenders are engaged in a frenzy of contrition for mistakes and insufficiently progressive positions past, and while there’s laudable humility (along with plentiful calculation) in that, it sometimes has a desperate ring. Social-media posts that are meant to convey accessibility, transparency and unvarnished charm can come across as stagy and needy. And there’s a rush to promise Democratic primary voters anything and everything they want. No candidate has had a more successful rollout than that of Kamala Harris, who was terrific in a widely watched CNN town hall. But she got tangled in her statements and then clarifications about her position on Medicare for all. Yes, she was O.K. with the abolition of private insurance. No, wait, she saw no reason that it had to go away. She chose Door No. 1 and Door No. 2. Which isn’t necessarily evasive: A politician can be amenable to several fixes and solutions, some grander than others. But still she seemed intent on not losing the love of even one voter. Most of the Democratic candidates, including her, have rallied behind the Green New Deal, a profoundly progressive resolution with a set of environmental and economic goals so sweeping and idealistic as to be politically fantastical. It’s an admirable way of recognizing the direness of climate change and of reaching so high that coming up short would still be meaningful improvement. But many of these candidates’ quickness to embrace it without qualification has as much to do with indulgence as with leadership. In the context of Trump and the unprincipled Republicans who have enabled him, Democrats’ willingness to search their souls, admit error and think expansively and inclusively is beyond refreshing. But too much self-flagellation and genuflection can look foolish and smack of fakery. Watch the measure of saccharine; add several teaspoons of salt. Consider Nancy Pelosi. She’s having a moment in part because she’s speaking bluntly and not afraid to ruffle feathers. (“The green dream, or whatever they call it,” she said when asked about the resolution.) She helped lead the party to triumph last year. She can point the way to an even more important triumph in 2020.